Multiple Sclerosis is one of the most common chronic diseases of the central nervous system (brain and spinal cord). Currently in New Zealand there are over 4000 people living with a diagnosis of MS.
MS causes disruption to nerves which conduct electrical impulses to and from the brain. The resulting interference with messages travelling through the nervous system causes a range of problems for people with MS. It is a difficult disease to describe because it will impact on people so differently. Some people will be mildly affected, others progress more quickly. The cause of MS is still unknown. Women are affected three times as often as men. In spite of research funded by organisations like MSNZ, its cause remains a mystery. • One of the most common diseases of the central nervous system (CNS). • An unpredictable inflammatory neurological condition affecting the central nervous system (CNS – consisting of brain and spinal cord). • Through the CNS, we pick up signals from the outside world—such as what we can see, smell, taste, hear and feel. The CNS also coordinates all our conscious and unconscious activities—such as moving, talking, thinking, remembering, and even reflex actions that happen without us thinking about them. • Most healthy nerve fibres are covered by a fatty substance called myelin, which protects the nerves and aids the flow of messages. In MS, the myelin breaks down and is replaced by sclera (scar tissue). This distorts or even blocks the flow of messages. 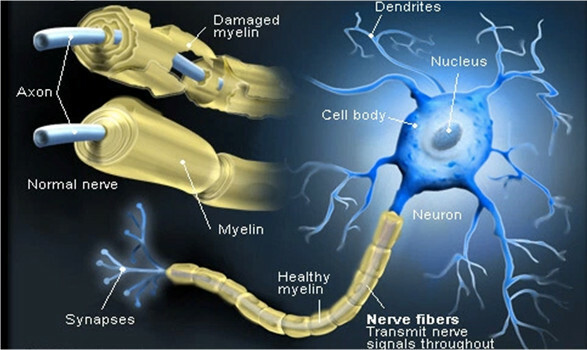 MS is the result of damage to myelin – a protective sheath surrounding nerve fibres of the central nervous system. When myelin is damaged, this interferes with messages between the brain and other parts of the body No one knows the exact cause but a combination of several factors, environment, viral and genetic predisposition may play a role. Risk of MS is largely determined before the age of 15 years. Where a person is born and grows up appears to have an impact on their chance of developing MS. There is also a growing amount of research that suggests that a lack of vitamin D could be a factor in causing MS. We get most of our vitamin D from exposure to sunlight. Low levels of vitamin D have been linked to higher numbers of people developing many different conditions, including MS.
MS is more common in areas further away from the equator. It is virtually unheard of in places like Malaysia or Ecuador, but relatively common in Britain, North America, Canada, Scandinavia, southern Australia and New Zealand. The evidence is also growing that smoking plays an important role in MS. Studies have shown that smoking increases a person’s risk of developing MS and is associated with more severe disease and more rapid disease progression. Fortunately, the evidence also suggests that stopping smoking — whether before or after the onset of MS — is associated with a slower progression of disability. Some researchers believe that production of antibodies in reaction to an infection may set of an autoimmune reaction. No single virus has been identified as definitely contributing to MS, but there is growing evidence that a common childhood virus, such as Epstein Barr virus (which can cause glandular fever), may act as a trigger. This theory is still unproven and many people who do not have MS would have also been exposed to these viruses, so just like genes, they are unlikely to be the whole story. While MS can occur more than once in a family, it is more likely this will not happen. There's only around a two per cent chance of a child developing MS when a parent is affected. MS is not inherited in the way that some conditions are passed from parent to child. Since there's so much we don't know about MS, we cannot predict who might get it. We can, however, detect a pattern in the people who are more likely to develop MS.
Women are three times more likely to develop MS than men. Multiple Sclerosis occurs more often between 40 and 60 degrees latitude. Thus, the occurrence of MS is higher in places such as Canada, Scotland, and the South Island of New Zealand than it is in tropical and sub-tropical areas. Even in high-risk areas, MS rarely strikes certain racial groups (e.g. Maori and Polynesians, native Americans, black South Africans). Being diagnosed with MS does not necessarily mean a life of disability. Most people with MS lead a fairly normal life for most of the time, with occasional attacks of symptoms. • Some people with benign MS will never show any obvious signs of a disability. • A few will experience only one attack or relapse. • Others go into a long remission. • Most people with MS have the relapsing/remitting form of the disease, in which there are periods of relapse (increased level of symptoms), followed by remissions (fewer, or no, evident symptoms). • Other people have the progressive course, which means their symptoms become progressively worse and they become disabled. ...are often slight and go away without treatment. But as time goes on, they may become more numerous and severe. ...is a short period of acute symptoms, followed by easing or disappearance of symptoms for weeks, months, or even years. ...depending on the part of the nervous system affected. - Magnetic Resonance Imaging (MRI) Scan –MRI (magnetic resonance imaging) is currently the preferred method of imaging the brain to detect the presence of plaques or scarring caused by MS.
- Lumbar Puncture – A lumbar puncture (also known as a spinal tap) is used to take a sample of spinal fluid to test for abnormalities. - Evoked Potentials – simple tests that measure the time it takes for the nerves to respond to electrical stimulation. It can take time to arrange these tests and the results may not always be conclusive. There is currently no cure for Multiple Sclerosis. But much can be done to help people with MS to remain independent, comfortable and productive. Corticosteroids IV Methyl Pred is often given for 5 days following a MS attack. Disease modifying drugs, Avonex, Beta Interferon and Copaxone have been available in New Zealand for some time and are used for relapsing remitting MS.
MSWT recommends our clients consider lifestyle changes as researched by Professor George Jelinek. This is NOT instead of medical intervention it is very important that you take the advice of your Neurologist, the recommendations for healthy living are in addition to any treatments recommended to you by you Neurologist or other health provider. Exercise programmes and muscle retraining can help patients recover from acute attacks, and can relieve tightening in muscles. Walking aids or other devices help many people with MS to be more self-reliant. The course of MS is unpredictable. Needs and disabilities change. Continuing medical supervision is essential. Not all medical problems are due to MS. A doctor can determine if they are symptoms of another illness that requires treatment. Although there is not yet a cure for MS, there is much you can do to keep yourself independent and productive. You can ask your doctor to prescribe medication for specific symptoms for example spasticity, pain, depression and bladder issues. Researchers are continually learning more about the management of MS symptoms and finding better ways to assist people to manage their own care. It is wise to try and avoid situations that cause a rise in body temperature, such as an over-heated home, very hot baths or sunbathing. A rise in body temperature can cause a temporary worsening of MS symptoms. When your temperature returns to its normal level, your usual level of functioning should return. There is some debate about how diet impacts on MS, a good balanced diet with plenty of fruit and vegetables which is low on processed food, sugar and fat is advised. Uncertainty about the future creates stress which can make symptoms worse. Just having MS imposes considerable stress on you and your family. Relaxation and good stress management are very important - the better you become at managing stress, the more your quality of life will improve and you will cope better with the ups and downs of this disease. MS can impose considerable stress on relationships. It is important that you are able to communicate your feelings with, and keep informed, those with whom you have a close association - your family, friends, employer and GP. If you listen carefully to your body you may avoid trouble. Fatigue, burning skin, intermittent numbness and tingling, intermittent double vision, and night sweats are all familiar, but often ignored, warning signs. It is uncommon for a patient to slip into a relapse without at least one of these warning signs, or symptoms, preceding the episode. Rest can often help with symptoms. If you are concerned ring your GP, neurology nurse specialist or MS support worker for further advice. MS is a chronic disease of the Central Nervous System. MS means, literally, "many scars." The cause of MS is unknown. It could be a virus, an auto-immune reaction, or a combination. MS is not preventable or curable (YET!). MS is NOT congenital, but there are some hereditary factors. MS usually strikes people when they are aged 20-40. More women than men get MS. There are approximately 3 women to every man with MS. The occurrence of MS is highest in temperate zones (such as New Zealand and northern Europe). The name Multiple Sclerosis was first applied to the disease in 1868 (by Charcot in France). Most people with MS lead a fairly normal life, most of the time. Symptoms of MS usually appear, and disappear unpredictably. People with MS need to get adequate rest to reduce fatigue. A process in which the body's immune system causes illness by mistakenly attacking healthy cells, organs, or tissues in the body. Multiple Sclerosis is believed by many to be an autoimmune disease, along with systematic lupus erythematosus, rheumatoid arthritis, and many others. The precise origin and pathophysiologic processes of these diseases are unknown. One brand of beta interferon, given once a week by intramuscular injection. A medication manufactured from naturally occurring interferons. The core nerve fiber extending from a cell body which is protected by the myelin sheath. It carries signals from a nerve cell to another nerve cell or to a muscle. Some people with MS are described as having a benign form of the disease. It is not possible to diagnose someone initially as having this form of MS, as it is only by looking at the disease ten or fifteen years after its onset that the pattern is visible. Benign MS has little impact on daily living. Individuals may experience a few mild attacks, or relapses, but no ongoing disability. Also known as Interferon Beta. Interferons are proteins made by the body in response to a foreign stimulus (e.g. a virus) and which appear to regulate or modulate the immune system. Beta Interferon (one of the three types of interferons) appears to "calm" an overactive immune system. Beta Interferon has been shown to reduce the risk of disability progression in MS, reduce relapses, and reduce the number and size of active lesions in the brain (as shown on MRI). One brand of Beta Interferon, given alternate days by subcutaneous injection. A semi-permeable layer around blood vessels in the brain and spinal cord that prevents large molecules, immune cells, and potentially damaging substances and disease-causing organisms (such as viruses) from passing out of the blood stream into the central nervous system (brain and spinal cord). A break in the blood-brain barrier may underlie the disease process in MS. The central nervous system consists of the brain and spinal cord, which control the main bodily functions. Of long duration, not acute; a term often used to describe a disease showing gradual worsening. Most people with Multiple Sclerosis experience a Relapsing Remitting form of the disease. In Chronic Progressive MS, however, there is a gradual deterioration in neurological function. The degree of progression, and the time over which it takes place, vary from one person to another. Chronic Progressive MS may be Primary or Secondary in type. Glutarimer acetate. A substance that has similar effects to Beta Interferon in reducing MS attacks. It is given daily by subcutaneous injection. Destruction of myelin, resulting in disruption in the flow of messages between the brain, spinal cord and other parts of the body. Recordings of the nervous system's electrical response to the stimulation of specific sensory pathways(e.g. visual, auditory, general sensory). In tests of evoked potentials, a person's recorded responses are displayed on a oscilloscope and analyzed on a computer which allows comparison with normal response times. Demyelination results in a slowing of response time. EP's can demonstrate patches of damage along specific nerve pathways whether or not symptoms are present, making this test useful in confirming the diagnosis of MS.
A complex system of various types of cells that protects the body against disease-producing organisms and other foreign substances. Also called spontaneous voiding; the inability to control passage of urine or bowel movements. Insertion of a hollow needle into the lower spinal canal to withdraw cerebiospinal fluid (CSF) for diagnosis. A diagnostic procedure which produces visual images of different body parts without the use of X-rays. Nuclei of atoms are influenced by a high frequency electromagnetic impulse inside a strong magnetic field. The nuclei then give off resonating signals which can produce pictures of parts of the body. An important diagnostic tool in MS, MRI makes it possible to visualize lesions in the white matter of the brain and spinal cord. A fatty substance which covers nerves, assisting in the passage of messages along the nerves between the brain and every part of the body. A bundle of nerve fibers (axons). The fibers are either afferent - leading toward the brain and serving in the perception of sensory stimuli of the skin, joints, muscles, and inner organs; or efferent - leading away from the brain and mediating contractions of muscles or organs. An inactive substance administered to a patient, usually to compare its effects with those of a real drug. A form of Chronic Progressive MS, in which there is gradual deterioration from the onset of MS, without sudden relapses. About 10% of MS cases are Primary Progressive. A temporary aggravation of disease symptoms, resulting from an elevation in body temperature or other stressor (e.g. an infection, severe fatigue) and which disappears once the stressor is removed. A pseudo-exacerbation involves symptom flare-up rather than new disease activity or progression. The appearance of new symptoms, or the aggravation of old ones, lasting at least 24 hours (also called "attack," "exacerbation," "flare-up," or "worsening"); usually associated with inflammation and demyelination in thebrain or spinal cord. MS follows different patterns in different people. The Relapsing Remitting form of MS follows a course of relapses where there is an increased level of symptoms, followed by remissions in which there are fewer, or no, evident symptoms. The periods of acute attack occur when a patch of inflammation damages nerve fibers so that messages do not pass clearly from the brain to other parts of the body. The frequency and severity of relapses varies. Some people with Relapsing Remitting MS go on to develop Secondary Progressive MS. When the symptoms of MS get better temporarily - possibly for years. The repair of damaged myelin. Myelin repair occurs spontaneously in MS but very slowly. Research is currently under way to find a way to speed the healing process. scarring of nerve tissue in areas of demyelination. A form of Chronic Progressive MS, in which some people who begin with Relapsing Remitting MS find that over time their symptoms gradually worsen without relapses. Some people continue to experience occasional relapses in this phase. An organic compound, containing a carbon ring system, which has a powerful anti-inflammatory action and can also reduce blood brain barrier leakage. Used in the treatment of Relapsing Remitting MS.